My DD (darling daughter) and her DD - her darling dummy. The bane of my bloody existence! We started off so well, DS only had a dummy from about 4 weeks to 10 months, he threw it out of his cot himself and it never came back. 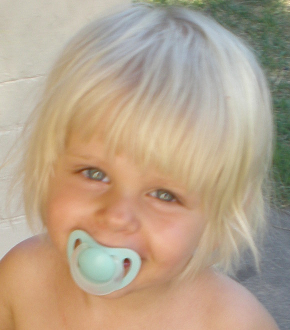 DD on the other hand has been very very very VERY keen on her dummy since a tiny wee babe. And now DD is getting on for 5 and still obsessed with it. *sigh* To be honest I find I don't have the mental wherewithall to stand the crying if we took it away. We've done books about it, talked about giving it to Santa at Christmas ('nooooooooo, Mummy! '), 'leaving it in England' when we went in July, giving it to a baby, getting rid of it when we get our puppy, getting a really cool present from the Dummy Fairy (she's real, I swear), all sorts of things. We've had periods where she's very good about only having it at home, or in the car, or even just in bed, but then she started kindy, then we went to Europe so she needed it for the flight, and all the travelling, and then we were in a car crash, and then back in Australia, and more kindy, and here we are. Stuck with the little bugger (the dummy, not the DD!). Rumour has it you also tried throwing it in the dirty Torrens - can't believe that didn't work!! !